The 28 x 28" Westcott Apollo is a softbox based on an umbrella frame fabricated from fiberglass for added durability. It needs no speed ring to attach it to a flash head. Simply open it, and slide the shaft into the umbrella receptor on the flash head or the umbrella swivel supporting your speedlite. A lightweight reflector plate may be purchased separately to produce indirect lighting. The 28" Apollo can be used with flash, fluorescent sources or hot lights up to 500 watts. 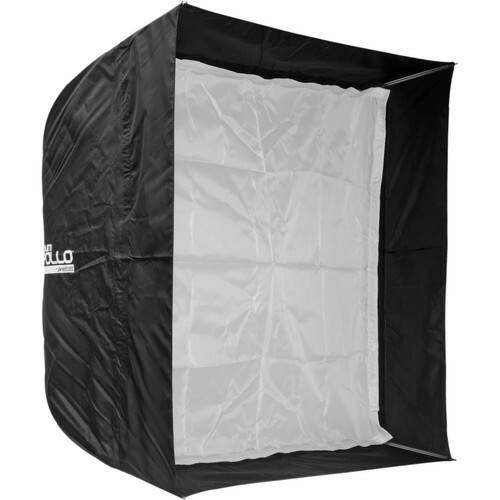 Box Dimensions (LxWxH) 39.0 x 3.0 x 2.8"
Apollo Softbox with Recessed Front (28 x 28") is rated 4.2 out of 5 by 93. Rated 2 out of 5 by Ian the Rider from Good starter softbox, not tough enough This softbox setups easy, and is useful for someone like myself who is just learning to light since it doesn't need a speedring to mount. Its limitations became quickly evident though, when I started to bring it around or try different angles. Its umbrella like design means it's susceptible to being crushed by its own weight if it falls, which happened to me scarcely a week after getting it. The arms of it don't extend out anymore, so my softbox is no longer square. The inability to angle it is also a hinderance to creative lighting. My recommendation for it would be to use it indoors only, weighted down, or spend the money to get a more durable one with an adjustable bracket if you plan to do more with lighting in the future. Rated 5 out of 5 by Pillspusher from Great softbox Sturdy build with high quality material. I like how portable this is, just fold in down like a umbrella. White face is velcroed on the sides make for quick set up. Gives a nice soft even light. I use this with my Speedlite 580EX II inside, mounted on a umbrella bracket and triggered via radio trigger. Rated 5 out of 5 by QRB from At long last ... the right size I do mostly environmental portraiture. The Apollo builds have been very kind to me in recent years... I have the Orb, the Strip, and the 50-incher (which is pretty similar to the Orb). For some reason I waited till now to buy the standard 28x28 model. I wish I would've bought it sooner, then expanded to the others. That would've probably helped me visualize the way light works more... Anyway, for most of my shoots I just use a standard shoot-through umbrella. That's the simplest way to light up a whole room quickly (for my day job, I tend to turn off the overhead lights because they're usually an ugly fluorescent). But I wanted a more controlled light that could still illuminate a full upper body. Hence, the 28x28 softbox. Here's a shot from my first shoot with it today (I used a grid to further control the beam). Window light filled up the background. 50mm 1.2/L at f/2.5, 1/125, ISO 125. Rated 4 out of 5 by Alex2pnt0 from Most Convenient Modifier I Own I bought this to replace having to use the very large 39 Elinchrom Deep Dish Octa. I also wanted something that accommodates eggcrates. I was nervous about it not having an inner baffle but I have been able to get very soft falloff without the extra diffusion. It is nice and deep for a softbox, which I feel provides a rich wrap-around quality to the light. I'd like one just like this with a white interior instead of silver. Sometimes the way one has their strobe head tilted inside the box makes zipping it up all the way difficult. The umbrella style is super convenient, though. I have a whole mess of these Westcotts and they all fit into small spaces because they break down so well. Rated 5 out of 5 by David from Like it's ease of use Although I've not used other soft boxes, I can't compare it to others. I like that it's based on the umbrella frame. It pops open easily without having to build and attach a speedring like other systems. The flash is mounted inside and facing the back of the soft box which gives a nice soft light. I believe you loose 1- 1 1/2 stops of light. For the most part, I've been able to use my speedlite at half power with relatively good success and results. The front baffle uses velcro to close and makes it easy to access your speedlite and make adjustments when necessary. The bottom opening uses zippers to seal the softbox. Although you can use a standard light stand, you're limited as to how much you can angle down the softbox. I would recommend that you have a boom arm or a light stand that has an extension arm that will allow you to angle the top portion. It'll give you more flexibility in adjusting the angle and positioning. Overall, I'm very pleased with the quality of the build, ease of setup, portability and quality of light. I would definitely recommend this or the 50 (my next purchase) to anyone doing location shoots. If you're in a studio, the ease of setup may not be an issue. I don't think you can purchase a better softbox at this price point. Rated 5 out of 5 by Anonymous from INDISPENSABLE...... Whats to say ... it's a Westcott Apollo. I can't imagine not having this in my kit. If you take portraits it's a must have ... the light is awesome. One thing, expect the white face material to be very wrinkled when you get this. An iron on low nylon heat easily corrects the problem. Then what I do is roll it up around a small wooden dowell and slide it in a cardboard tube left over from wrapping paper, throw it my grip bag and it stays pretty much wrinkle free. Rated 4 out of 5 by Lex from Very good medium softbox. This is my go-to softbox. Small enough to pack easily, large enough for broad light, and deep enough for some punch. The fiberglass support rods are a welcome improvement over traditional stamped-steel designs. More flexible, and resistant to buckling and denting. Easy to pack in slightly hostile locations. The only reason I didn't give 5 stars is that the fabric is somewhat sensitive to abrasion. I've put a few small holes in mine thanks to resting it against a couple concrete blocks in my trunk. In a few days, it wore through. Easily repaired, and easily avoided, but something to watch out for. Are there any CFL fixtures that will work with this? Looking for this to pull double duty for stills as well as video. I know the D5 will fit in the orb, looking to put a continuous light in here as well. From Westcott's Apollo product description The 28 Apollo can be used with flash, fluorescent sources or hot lights up to 500 watts . Would this work nicely on the AD600 and AD200? This Medium Apollo will pair nicely with the AD200. I would suggest using it with the bare bulb in a rear facing position to maximize the spread of light in the modifier. The size of the AD600 and therefore the fit inside the box may not make it ideal unless you use the accessory H600b remote head. How can this soft box be used for video lighting. Please include exact recommendations of which lights to consider using. I didn't use this for video lighting I used this for my external flash on my camera. Given your specific question I would think that if you used a 100+ watt bulb you should be able to use it for video, easily. Can the box be tilted? If so, what keeps it in place? Thanks. I love it. It is really easy to carrier with me, set up for shoot photo ad. Can this be carried in a 28 suitcase if taken out of the box? What are the actual dimensions? Straight out of my box, it measures about 35 in.from end to end. Somewhat similar to a large umbrella. When opened it is 28 28. across. Height is approximately 24 in. when standing on a surface in an open position, dome downward. Guys Do you think I can use this Softbox with a Strobe head light also ? or just speedlite flash ? I used it before with an Alien Bees, works but pretty tight in there. Works better with speedlight. Will this softbox work with an optical trigger? Since the flash is enclosed I was not sure if it would prevent the transmission of the signal from camera to flash. Honest answer is: I don't know. I use the 10m(33ft) cord that Syl Arena recommends. It allows you to control the OCF from the camera's menus. Don't use a curly one, you will pull the light stand over!